According to Statista, the use of Network Attached Storage (NAS) has been on a rise. The importance of NAS devices is escalating because their use cases are not limited to just a data storage option anymore. If you already own a NAS, you can use the device along with NAKIVO Backup & Replication in order to enhance your VM data protection. By installing NAKIVO Backup & Replication on your NAS device, you can create a high-performance VM backup appliance – which can answer the majority of your data protection concerns. Until now, a native package of NAKIVO Backup & Replication has been available for a wide variety of NAS servers produced by well-known storage vendors such as ASUSTOR, QNAP, Synology, and Western Digital. Beginning today, you can now also create a high-performance VM backup appliance based on NETGEAR ReadyNAS devices – NAKIVO Backup & Replication package for NETGEAR is officially available for download on NAKIVO’s website. NAKIVO Backup & Replication supports the majority of NETGEAR ReadyNAS devices, ranging from entry-level to high-end ones. NETGEAR ReadyNAS servers are known for their reliability, fast operation, and sturdy design. By combining your ReadyNAS with NAKIVO Backup & Replication, you can build a reliable and versatile appliance that features multiple benefits. With NETGEAR ReadyNAS-based VM backup appliance, you obtain truly outstanding backup performance. By having the software installed on your NAS server, VM backups are written directly to NAS disks, without the overlay of CIFS and NFS protocols. Furthermore, NAKIVO Backup & Replication includes other features that can give your backup performance a significant boost. Incremental backups with CBT/RCT (Changed Block Tracking/Resilient Change Tracking), Network Acceleration, Skipping Swap Files and Partitions as well as LAN-free Data Transfer also ensure faster backup speed, and thus save you time that can be used on other important tasks. The appliance can take care of all data protection routines with VMware, Hyper-V, and AWS EC2 environments. Moreover, NAKIVO Backup & Replication can further strengthen your data protection by sending copies of your backups to the cloud. This way you can double-secure your data in case your primary backups are compromised, or even your storage device is destroyed. Being a part of the appliance, NAKIVO Backup & Replication is rich in features that were designed specifically for storage space optimization. In addition to performing incremental backup, the software can compress and deduplicate data. This way you can make sure that backups consume as little space as possible. Furthermore, NAKIVO Backup & Replication excludes unnecessary data such as swap files and partitions, further reducing the size of your backup data. You can easily enhance your Disaster Recovery (DR) preparedness by separating the VM appliance from your primary environment. Since your backups are already stored on a separate device, you can simply move your ReadyNAS server to a different location to make sure that disasters can’t catch you off guard. In case of any unexpected events, you have everything needed for effortless disaster recovery combined in one solution. The NETGEAR ReadyNAS-based VM backup appliance includes backup hardware, software, and, most importantly, VM backups to recover from. Moreover, the advanced Site Recovery functionality of NAKIVO Backup & Replication can be used to build flexible site recovery workflows, perform recovery testing, and make sure your RTOs can be met. With NETGEAR ReadyNAS-based VM backup appliance, you can undoubtedly ensure the highest level of data protection possible, without breaking your budget. 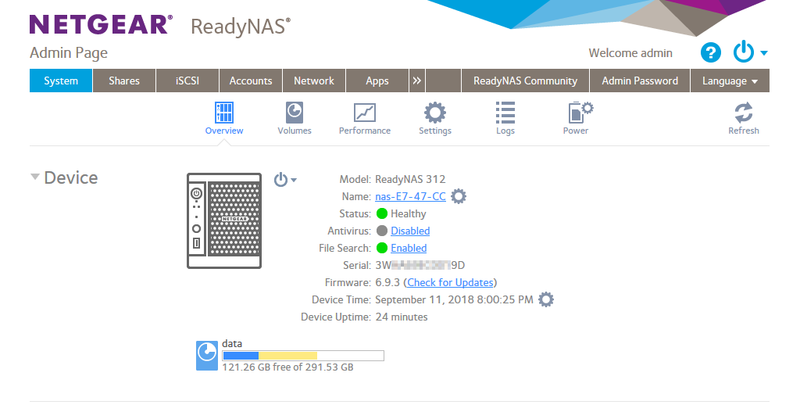 If you already use a ReadyNAS server for business purposes, you are only one step away from creating a high-performance VM backup appliance. Just install NAKIVO Backup & Replication directly on your device and start saving money. With the appliance, you don’t just get a generic storage device, but also backup hardware, backup software, backup storage, built-in global data deduplication, and backup-to-cloud solution. What is more important is that the installation of NAKIVO Backup & Replication takes only a couple of minutes. The process is intuitive and requires no technical expertise. Follow these steps and see with your own eyes! 1. Check if your NETGEAR ReadyNAS configuration is supported by NAKIVO Backup & Replication on the web page that lists the system requirements. 2. Access the NETGEAR ReadyNAS web interface from your web browser. In order to do this, enter the IP address of your NETGEAR ReadyNAS in the address bar. In the considered example the IP address for NETGEAR management is 10.10.10.18 and http://10.10.10.18 was typed in the address bar of the browser accordingly. 3. Go to the Apps tab and click Available Apps. 4. Find NAKIVO Backup & Replication by typing “NAKIVO” in the search field and click the Install button. You can install a full solution or a Transporter. 5. Once installed, NAKIVO Backup & Replication would appear on the Installed Apps tab. 6. Click Launch on the NAKIVO Backup & Replication icon to try out your VM backup appliance right away. 7. Access the web interface of your instance of NAKIVO Backup & Replication by typing the same IP address as used for your NETGEAR ReadyNAS management, but use HTTPS protocol and port 4443, for example, https://10.10.10.18:4443. Now you can use NAKIVO Backup & Replication and feel the advantages of deploying the product on NETGEAR ReadyNAS. NAKIVO Backup & Replication is a universal data protection solution that can be deployed as a virtual appliance as well as installed on Windows, Linux, and NAS devices. By installing the product on NETGEAR ReadyNAS, you get more flexibility, portability, reliability, and high performance. NETGEAR ReadyNAS-based VM backup appliance would be a wise investment for those who strategically approach the protection of their virtualized environments. You not only ensure that your business-critical data is safe with the reliable and robust data protection solution, but you also get more while spending less. Download the Full-Featured Free Trial to test the solution in your own environment.